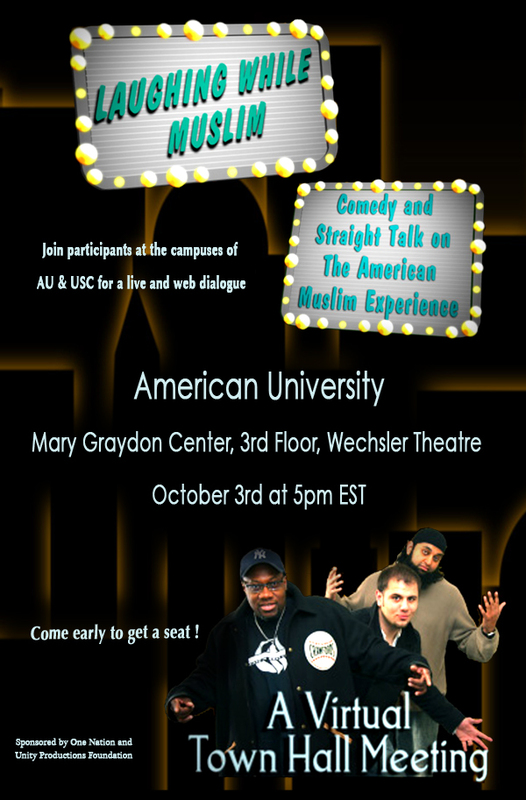 Comedy and Straight Talk on the American Muslim Experience! Spark Media, in an event co-sponsored by Unity Productions Foundation and One Nation, coordinated an innovative virtual town hall meeting with scholars and activists speaking to audiences at the University of Southern California and at American University in Washington, D.C., as well as an online audience. Introduced by comedian Mo Amer (from Allah Made Me Funny) and moderated by CNN correspondent Ralph Begleiter, the panels included Dr. Eboo Patel (Interfaith Youth Core), Dr. Jamillah Karim (Spelman College), Azhar Usman (Allah Made Me Funny), Edina Lekovic (Muslim Public Affairs Council), Kareem Salama (Musician and lawyer), and Sheikh Yassir Fazage (Orange County Islamic Foundation). They joined a diverse group of students and concerned citizens from coast to coast to take a part in a dialogue to dispel myths and create understanding.